Lest you think Theater Around The Bay, our catch-all column for general Bay Area Theater news and discussion, exist only so Stuart can rant, we thought we’d change it up this week and bring you a more somber bit of news from Theater In The Woods, who are part of the parent organization (Atmostheatre) that provides Theater Pub with its non-profit status and helped get us established. Karen Offereins, the Artistic Director of Theatre in the Woods, gives us a history of the project that recently closed its doors after a ten year success story. In 2002, five actors who met at a Studio A.C.T. class started a theatre company called Theatre in the Woods in Woodside. 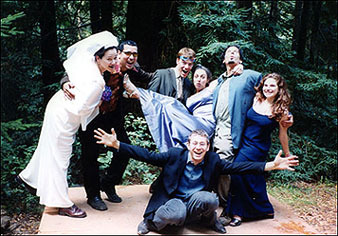 The first outdoor production was a combination of monologues and scenes featuring the five actors (and two ensemble performers) called Conversations in the Woods. It ran two weekends, with two shows back-to-back each day for an audience of twelve for each performance. 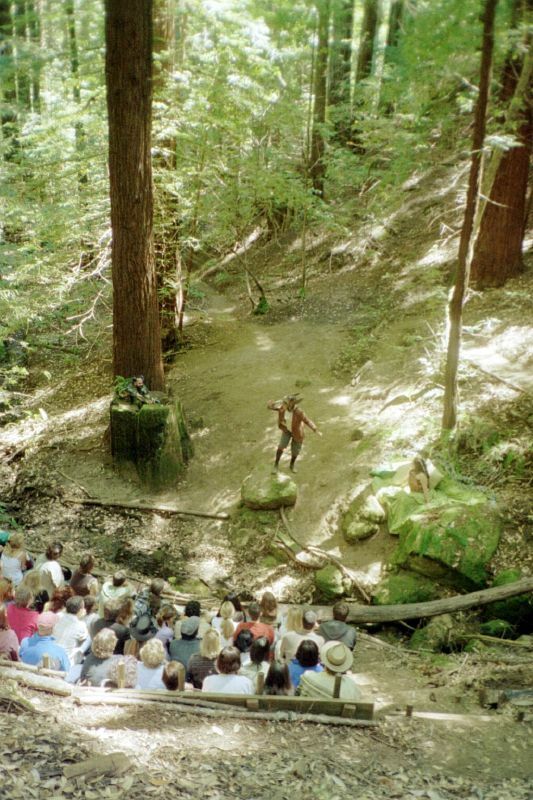 Our audience was led by a guide to various spots on the five acre property where different scenes took place. An entire summer was spent clearing a forest, setting up performance spots, building a mini stage, and preparing for the show. Just for fun. And to see if it could be done. I am one of those five actors, and I think I can say for all the co-founders that we didn’t think we’d do more than that one show. And we certainly never thought that we’d end up selling out three of our past four productions, entirely. After ten years, eleven productions, and many changes to our small staff, I’m still amazed at what we created from such a small core group of people. We produced all but one show at our outdoor forest site, mostly incorporating our trademark of using multiple locations in the forest for each production. In 2006 we changed our company name from Theatre in the Woods to AtmosTheatre when we decided to expand to San Francisco and produced our first show there in the backyard of a hair salon, two one act plays by John Patrick Shanley that we called Wash, Rinse, Repeat. Working with and in outdoor theatre is a real challenge. And for us, we had to do everything from scratch. 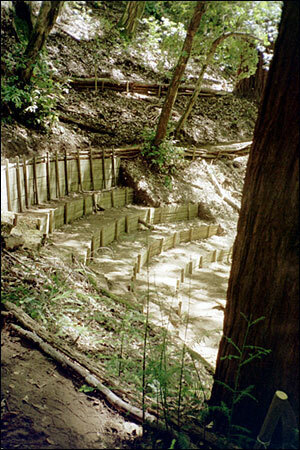 This involved building many projects: a mini stage, a full size stage, a bridge, a shed, picnic tables, and an amphitheatre with seating carved out of a hillside and another full size stage facing it, with Harrington Creek in-between. The amount of blood, sweat, and tears that went into producing our shows was only matched by what went into working at what we call, “The Land.” I can’t quite describe what it was like, except to say that watching the reactions of our audiences when they visited our bit of forest for an afternoon hike and theatre show made it all worth while. And I can shamelessly say that I think that people who got to see our shows were lucky. A still from “A Midsummer Night’s Dream” in 2007. “Why go dark? Well, the need to do so all comes down to what so much of theatre depends on (outside of talent), resources. While we were able to easily take part in the acting roles, we were not so good at finding big time donors/sponsors/grants or people (especially with their own transport) for our staff. You might think that selling out our shows would make it easy to afford our costs, but even the large successful theatre companies need major donors and sponsors to keep afloat. The lack of financial assistance and core company members proved to be too big of a hardship for the remaining few of us who were already finding it difficult to manage fulltime jobs along with keeping our theatre company running. So we decided to end our adventures at The Land, having created sold-out shows that delighted our audiences and having made long lasting relationships with artists and crew that will continue to live on and grow. Not a shabby way to end to our story. For now. Our credits: Conversations in the Woods (2002), The Woods (2003), No Exit (2004), The Ives of March (in August)? (2005),Rosencrantz & Guildernstern Are Dead (2006), Wash, Rinse, Repeat (2006, in San Francisco), A Midsummer Night’s Dream (2007),Freedomland (2008), The Frogs (2009), Alice in Wonderland (2010), and Twelfth Night (2011). This is all relevant to this blog because San Francisco Theater Pub was founded in 2009 by AtmosTheatre company members: Stuart Bousel, Victor Carrion, Bennett Fisher, and Brian Markley. Victor had often talked about a “Theater Pub” venue inspired by Joe’s Pub in New York, where we might expand our productions into San Francisco in a space that would be part bar, part theatre stage. Via the efforts of Stuart, Ben, Brian, and Victor, and an existing relationship with Cafe Royale’s then owner and AtmosTheatre, SF Theater Pub was born. I feel truly fortunate to have been a part of it, to have shared it with so many people, and to have been able to end our tenure on such a high note. We may return someday. We weren’t able to say to each other that we’d never come back. And based on our patrons’ responses to the announcement of our going dark, we’ll have an audience to return to. That’s something to be quite proud of. 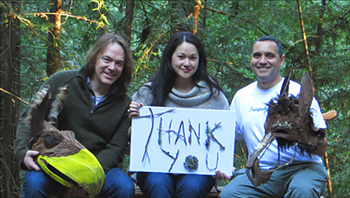 Brian Markley, Karen Offereins, and Victor Carrion, the remaining co-founders thank their collaborators and audiences. Karen Offereins has been the Artistic Director of AtmosTheatre for six years and is a Bay Area actor, producer, and director. More information about AtmosTheatre can be found at their web site – www.atmostheatre.com. This entry was posted in Theater Around The Bay, Uncategorized and tagged Atmostheatre, Brian Markley, Harrington Amphitheatre, Karen Offereins, San Francisco Theater Pub, Theater Around The Bay, Theatre In The Woods, Victor Carrion. ← THE HEART PLAYS on FEBRUARY 18th- One Week From Today! As someone who took part in that final show, I can say that Theatre in the Woods will be greatly missed. Thank you for this history. I was unaware, and thus unable to see an Atmos show. It appears you created something idyllic: if not now, for yourselves, certainly then, for your audiences–with a great deal of love, courage and perspiration! I am sorry to have missed this phenomenon, and glad that the spirit continues, in the Theatre Pub and beyond. I’m so sorry to hear this. I enjoyed three of Atmos’ productions. While getting there always took a commitment, it always paid off with a memorable day of nature and theatre, two of my favorite things in life. I truly hope you find a way to bring it back.